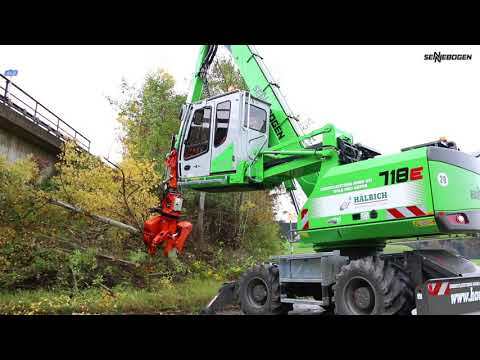 With all-wheel drive and two-axle steering, the SENNEBOGEN 718 machines are specially designed to remove trees efficiently, securely and lightly through all terrains. The ideal solution for all tree service operators. Used for thinning wood lots to harvesting wood fuel to clearing up storm debris up to 18” (457 mm) diameter and 40’ (13 m) high. Trimming, cutting, loading and stacking operations are all done from the confines of the operator’s elevating and tilting cab. LEARN MORE about SENNEBOGEN engineering features for this model.